Our friends, the Carrs, invited us to dinner at their place. 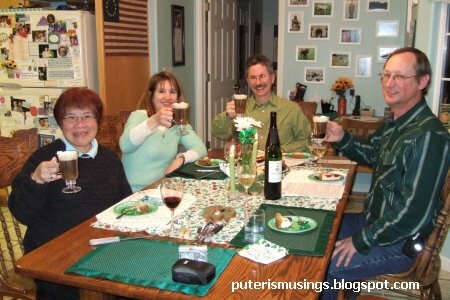 The traditional St. Patrick's Day dinner consists of corned beef and cabbage. The corned beef was baked with an apricot preserves glaze. It was delicious. But instead of cabbage we had brussels sprouts, and Irish potatoes. We brought wine and cheese cake to the dinner. Clockwise from front left: Catherine, Kathy, Richard, and Doug. An Irish toast, with Irish coffee. I remember when i was in Athens Ohio, they don't allow us to buy wine or any alcohol on Sundays. Kinda freak me out. I thought they were thinking I was underaged. I believe in ur area its not a problem. No there are no blue laws or dry counties in California. There are still places in the US that have dry counties .. no alcohol available for sale at all, legally anyway. I don't know if blue laws (no sale of alcohol on Sundays) are still in place in some places. So I did not taste the Irish coffee at all. Too bad. Those 4, enjoyed theirs!